Lions and rhinos and cheetahs—oh, my. Oh, yeah…and elephants and giraffes and impala and even penguins! Step out of the ordinary and into Africa for a vacation that will leave you in awe! This 9-day Monograms vacation to South Africa is as fantastic as they come, introducing you to everything that makes this country so unique—from bustling cities and unrivaled national parks to stunning south-of-the-equator scenery. Your Monograms adventure includes hotel accommodations for three nights in Cape Town and two nights in Johannesburg, private sightseeing, breakfast daily, and two lunches. Plus, in each city a Local Host® is at your service—a friendly face and expert on the local scene who ensures your vacation runs smoothly, answers your questions, and helps you personalize your experience. You’ll also spend three unforgettable nights in a private game reserve in the Kruger National Park area, with breakfast, lunch, and dinner included daily. From the moment you take your first step, the Monograms difference becomes apparent. Your vacation begins in Cape Town, where your Local Host will greet you with a warm welcome at your hotel and plenty of tools to introduce you to this exciting city. Dig into a delicious included breakfast the next morning before a private guided tour featuring a cable-car ride to the top of Table Mountain for spectacular views of Cape Town. Next, descend from the mountain to the ocean as you visit Boulders Beach with its delightful colony of African penguins. Lastly, explore beautiful Cape Point Nature Reserve—home to Cape Point, the southwesternmost point on the continent. The following day is free to explore on your own or you can join an optional excursion. Just ask your Local Host for help and suggestions. Maybe join a morning or afternoon excursion to Robben Island, where Nelson Mandela was imprisoned for 18 years, or to the splendid Cape winelands for a magical day or half-day of winery visits and tastings. From June to December you can also choose to go whale-watching in Hermanus, the self-proclaimed whale-watching capital of the world. Next, travel to the Kruger National Park area, where we transfer you to your lodge in a private game reserve. From here, head out multiple times over four days with a professional Ranger in search of Africa’s “Big 5”—lion, leopard, elephant, rhino, and Cape buffalo. You’re sure to encounter many other species as well. Cap off each day with refreshing included sundowner drinks, the perfect way to relax and reflect as the sun sets over the beautiful South Africa landscape. Finally, embark a quick flight to Johannesburg, where your Local Host will welcome and acquaint you with the world’s largest city not situated on a river, lake, or coastline. Private sightseeing takes you inside the fascinating Apartheid Museum, SOWETO, and the homes of Nelson Mandela and Archbishop Desmond Tutu—and features lunch at a local “Joburg” restaurant. From start to finish, Monograms’ South African Sojourn is an incredible journey, with hotels, guides, sightseeing, and transportation already included! With the time saved and the comfort of knowing you have a local there to assist you throughout your vacation, you’ll be one happy traveler! 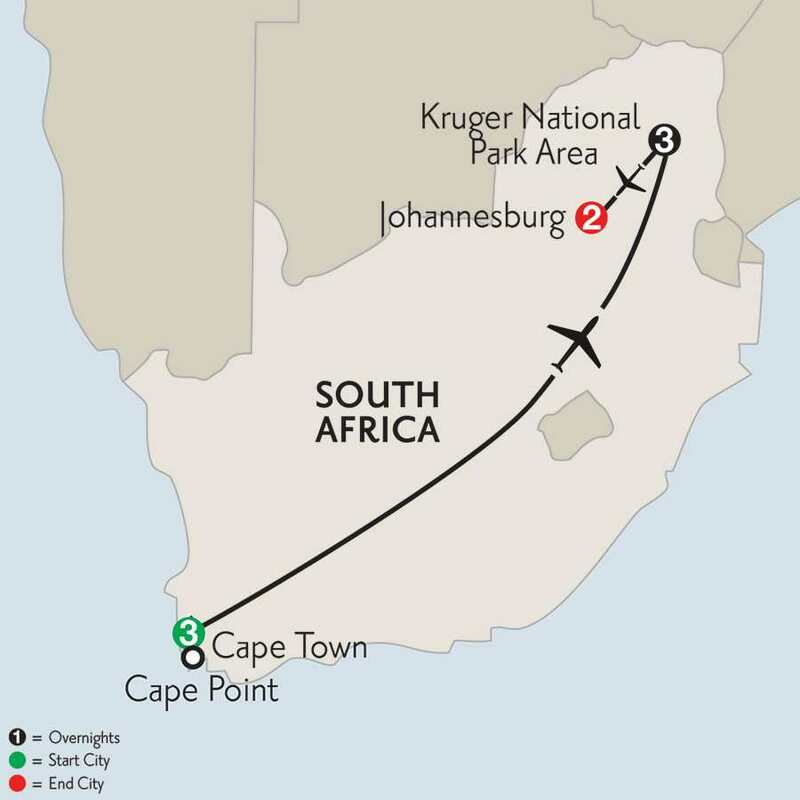 Private sightseeing vehicle in Cape Town & Johannesburg; shared 4-wheel drive safari vehicle in Kruger National Park area carries a maximum of 9 people; private (Cape Town & Johannesburg) or shared (Kruger area) airport transfers to/from intra-vacation flights; intra-vacation flights not included. Enjoy a full day at your leisure. You may choose to visit Robben Island, where Nelson Mandela was imprisoned for 18 years, or take an excursion to the beautiful Cape winelands for wine tasting. Enjoy two full days of game viewing in this wondrous land. Wake up early for a MORNING GAME DRIVE in an open-air, 4-wheel-drive Land Rover. Your skilled, professional ranger will help you learn about this special ecosystem as you view wildlife up close. After breakfast at your lodge, take advantage of free time to swim, read, or enjoy a drink at the bar. Tea will be served prior to your AFTERNOON GAME DRIVE. As the sun sets, stop for SUNDOWNER DRINKS in the bush! Return to your lodge in time to freshen up before dinner. Today’s PRIVATE SIGHTSEEING TOUR starts with a visit to the unforgettable APARTHEID MUSEUM. Here you will learn about the founding of South Africa before delving into the apartheid years. Continue on to SOWETO (South Western Township), the largest township in the country. You will see the Hector Pieterson Memorial, dedicated to the 12-year-old boy killed by police during a demonstration in 1976, and the neighborhood that was home to Nobel Peace Prize winners Archbishop Desmond Tutu and Nelson Mandela. Visit MANDELA HOUSE to gain perspective on life here. Enjoy lunch in a local restaurant before transferring back to your hotel for time at leisure.